Everything is awesome when you're Lego Batman! Being a Lego is pretty sweet, but literally nothing is cooler than being Lego Batman. He gets to live on his own island with all his high-tech toys because he's the sole protector of Gotham City and he doesn't need anyone else. Plus, he gets to eat yummy lobster thermidor every night for dinner without having to communicate with the rest of the world. Nope, he's not lonely at all! Batman doesn't need anyone! Not. One. Bit. Okay fine, Batman would like a friend or two, or maybe even a family to come home to after a long day fighting crime. Maybe he should take some time off from clashing with his one true enemy, The Joker, (and yes Batman does finally admit that he hates the Joker just as much as The Joker hates him), and adopt a son or search for a girlfriend? If you'd like to see Lego Batman branch out a little bit and start surrounding himself with a solid group of comrades then dress in this Lego Batman prestige costume and start making yourself emotionally available! 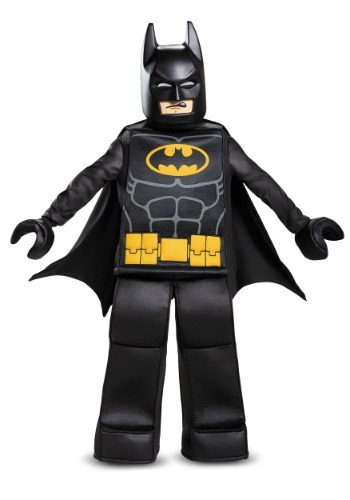 Boys will love wearing this box-shaped tunic, cape, and boxy elastic-waistband pants because it will completely transform them into the one and only, Lego Batman. Yes, he'll even get Lego Batman's desirable 9-pack! The unique u-shaped gloves complete the costume. Boys will love donning the character mask then venturing out with Barbara Gordon and Robin so they can lock Lord Voldemort and King Kong back up in the Phantom Zone...dun DUN dun!